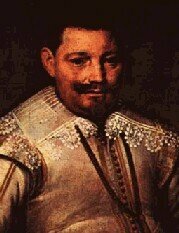 Piet Heyn was a terror to the Sapnish Main particularly around the island of Cuba. Heyn started out as a Dutch privateer of little consequence but after being captured by the Spaniards and enslaved in a ship's galley things changed. He was eventually freed in a prisoner exchange and took on duties as a captain of privateering ship. Heyn knew knew the silver fleet, the galleons that collected the gold and silver along the coast from Panama to Mexico would rendevous in Havana before heading out to Spain. Eventually Heyn commanded a fleet of around 30 ships. Heyn took his fleet and sailded boldy toward Havana. The Spanish Admiral, Benavides and his second in command Don Jaun de Loez, saw the approach of Heyn's privateer fleet and according to witnesses attempted to avoid contact but ended up grounding his fleet. Benavides claimed he attacked the Dutch fleet resolving rather die than be caught. Neither Benavides ship or de Loez fired a single cannon as their ships were approached and boarded by the Dutch. The Spanish Galleons were so loaded with gold and silver that they actually had blocked many of their gun ports, making it impossible to effectively engage the Dutch privateers. Heyn's men quickly boarded the Spanish ships right in view of Havana, and for several days looted the cargo making off with over 34 tons of Silver. The looting went on for several days until eventually Heyn sailed back to the Netherlands with asround fifteen captured Spanish ships as well as his original fleet. The rest of the Spanish fleet was burned in Havana Harbor. When the battle began Benavides desserted his ship in a row boat and headed for saftey ashore. He later testified that he had given orders for the ship to be burned and evacuated. Loez changed clothes and hid among the common sailors, fearing he would be executed by the Dutch. Heyn returned to the Netherlands a great hero, Benavides and de Loez were tried for cowardice and dessertion. Benavides was beheaded and de Loez imprisoned for life. Heyn would enjoy his status as Dutch hero for a few years. Eventually he went off to do battle against English pirates and had the unfortunate mishap of being blown apart by an English cannonball.